Brainstorming can be a challenge. It can be confusing when not done right. But it can be an effective tool when http://flevy.com/blog/wp-content/uploads/2018/12/Consulting-Framework-picture1.jpg 645w" sizes="(max-width: 300px) 100vw, 300px">effectively managed. Mastering the brainstorming technique sets consultants apart. Brainstorming techniques can enable effective consultants to analyze problems in a structured, focused, and logical way. Brainstorming involves the entire problem solving process all the way to the solution. Brainstorming technique is designed in a way that if the steps are done correctly, it keeps analysis on the right track. Consultants can ably progress through the initial problem solving process in a structured and logical way. When done in this manner, it keeps the process in the right track towards the right solution. There is a higher chance of arriving at the right answer. Brainstorming within consulting is not your ordinary brainstorming process. Brainstorming within consulting is within the context of a real strategic viewpoint. 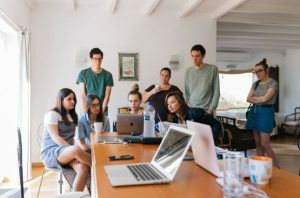 Setting our team distinctly different from others, the brainstorming technique teaches our team to analyze any problem in a structured and methodical manner. The Consulting Framework to Brainstorming is done within the context of a real strategy. Having a strategic perspective of the whys, what, and the where of what we need to do can lead our team to be ahead of the curve. Knowing your definition is essential in brainstorming. What is your definition? Are you clear with your definition? For having a wrong definition will definitely lead your team to incorrect brainstorming process. An incorrect brainstorming will result in wrong analysis and wrong solutions. Brainstorming is an effective tool when done right. Set the definition clearly then build your Decision Tree. A Decision Tree is a decision support tool in brainstorming. 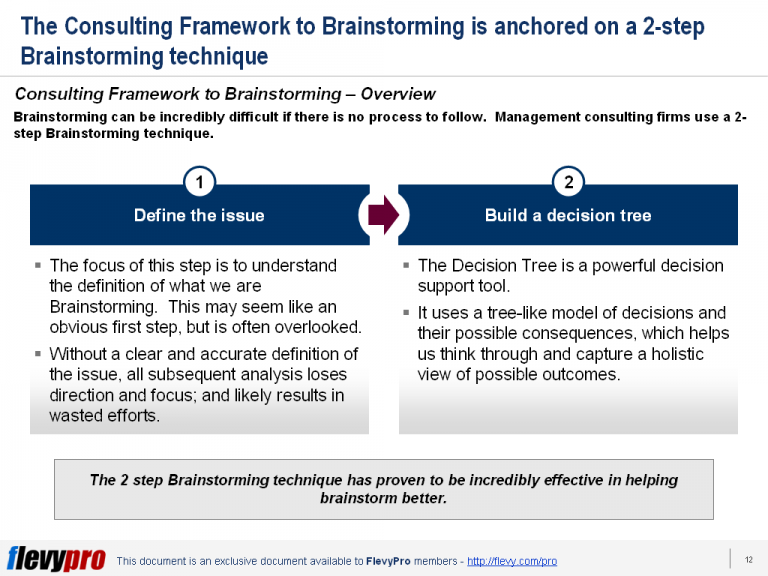 Brainstorming within the context of management consulting uses the Decision Tree-based brainstorming technique. A tree-like model of decisions and possible consequences, it displays an algorithm that contains conditional control statements. It is mutually exclusive and collectively exhaustive. Interested in gaining more understanding of the Consulting Framework to Brainstorming? You can learn more and download an editable PowerPoint about Brainstorming for Consultants here on the Flevy documents marketplace.